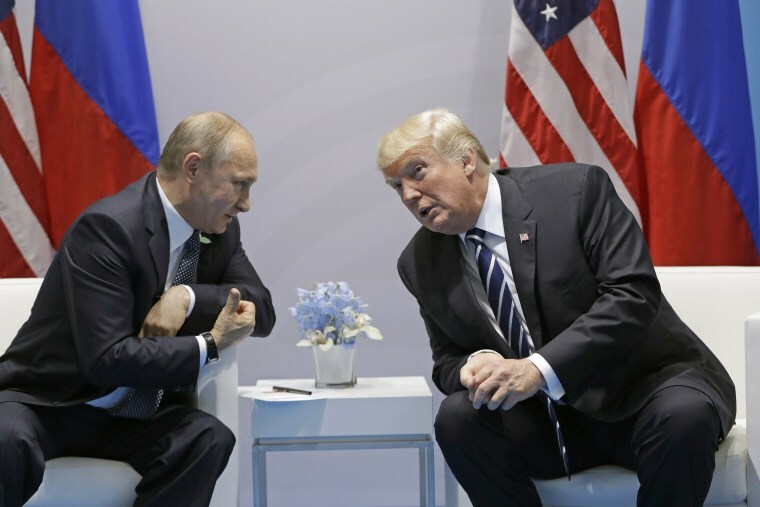 DANANG, Vietnam — President Donald Trump will not hold a formal meeting with Russian President Vladimir Putin here, but the two men are likely to bump into each other, the White House said. "There was never a meeting confirmed, and there will not be one that takes place due to scheduling conflicts on both sides,” White House press secretary Sarah Huckabee Sanders told reporters on Air Force One. "Now, they’re going to be in the same place. Are they going to bump into each other and say hello? Certainly possible and likely." The Russian government had previously said there would be a meeting between the two leaders, but White House officials remained vague throughout the president’s time in Asia on the status of the meeting. It would come as trump faces continued pressure at home over ongoing investigations into allegations that his campaign colluded with the Kremlin during the 2016 election, as well as Russian meddling in the race. But Trump has also called out Russia in recent days to do more in pressuring North Korea to abandon its nuclear program and provocative behavior. Trump and Putin met on the sidelines of G-20 Summit in Hamburg, Germany, and at a formal dinner there in July.